Diagram Studio software - Easily create professional-looking flowcharts and diagrams! Flowcharts and Diagrams Easier Than Ever! Floor plans, street and directional maps, traffic routings. and all whose who need to create professional-quality drawings. If you're new to DiagramStudio, you may need help getting started creating your diagrams. 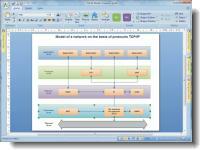 The lessons in Quick Tutorial teach you the basic skills you need to create any simple DiagramStudio diagram. Click here to to begin the tutorial. Diagram Studio requires Microsoft ® Windows 98/NT/2000/Me/XP/2003/2008/Vista. If you are running any of these operating systems and have a Windows-compatible mouse or pointing device, your system has already met all the requirements necessary to run Diagram Studio. A full installation of Diagram Studio requires only 14 megabytes of hard drive space. If a graphics printer or plotter is installed in Windows, it will work with Diagram Studio.